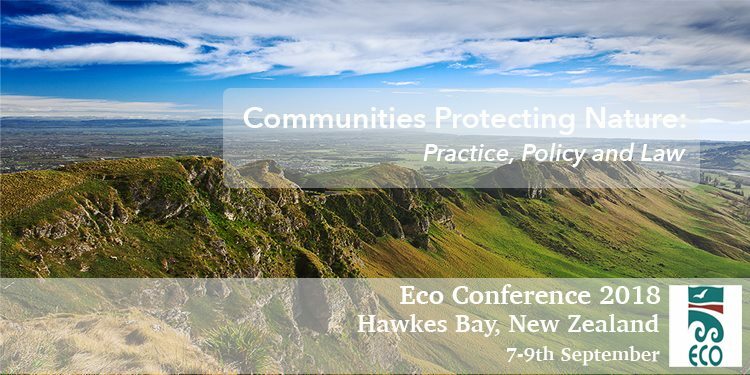 As an ECO Friend, you are warmly invited to the spring ECO Conference: Communities Protecting Nature: Practice, Policy and Law, from Friday 7th to Sunday 9th September. This will be held at the Pukemokimoki Marae at 191 Riverbend Road, Onekawa, Napier. ECO conferences are always enjoyable and stimulating, full with good company and speakers who are leaders in their field. You will go home full with ideas, energy and action-points: and good healthy food too. Registrations costs are reasonable, and the full programme will be up on our conference page very soon. Check out the Conference page on the website for details of the conference. You can register now here. Friends of ECO and anyone interested are all welcome to attend. A generous discount applies to ECO Friends. Registration is low cost thanks to support from DOC, MPI and Hawke’s Bay Regional Council. We offer marae accommodation at no extra cost. Our conference sessions include discussion on enhanced ecosystem- and place-based fisheries and marine management and how the public can be better included. We’ll also discuss how we can ramp up work and improve networks to protect the environment from risks from weeds, pathogens, predators and marine invasive species. Community action and policy development work to protect native species and ecosystems, climate change law and action, and regional, local and national community efforts on better land use, improved water management and kaitiakitanga of ecosystems, are all part of the programme. Minister Stuart Nash will be talking with us about better management of New Zealand fisheries. Minister David Parker is speaking to us on the Friday. Mike Joy and James Palmer will also speak. Hapu and iwi, community groups, land-based producers and many others are on the programme. Come along. We’ll also discuss how we change norms of land use, our goals as a society, and the things we need to do and change. There will be much of interest to ECO Friends, and those working in the areas of conservation, restoration and environment. Email us on eco@eco.org.nz for more information or head on over to our website for more information.